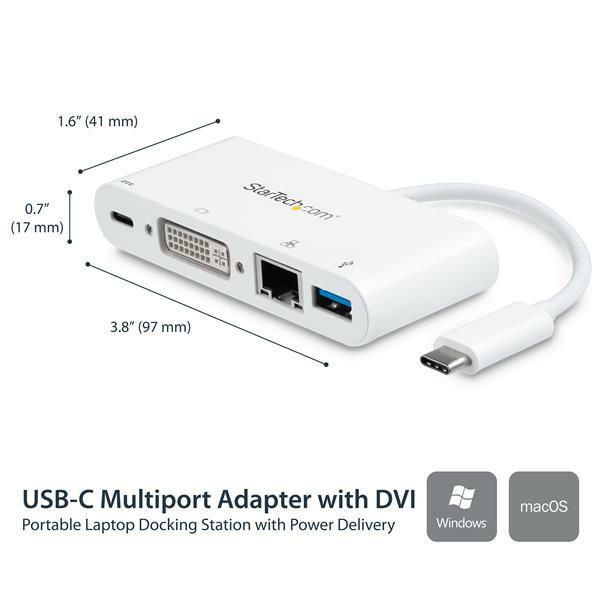 This USB-C multiport adapter equips your USB-C Windows or MacBook laptop with essential connections, including a DVI output, a Gigabit Ethernet port and a USB 3.0 (Type-A) port. Plus, you can power both the adapter and your laptop simultaneously, with 60 W USB Power Delivery 2.0 and a USB-C power adapter. The versatile adapter combines the performance of three single-function adapters into one powerful solution. Add a second display through the DVI port. 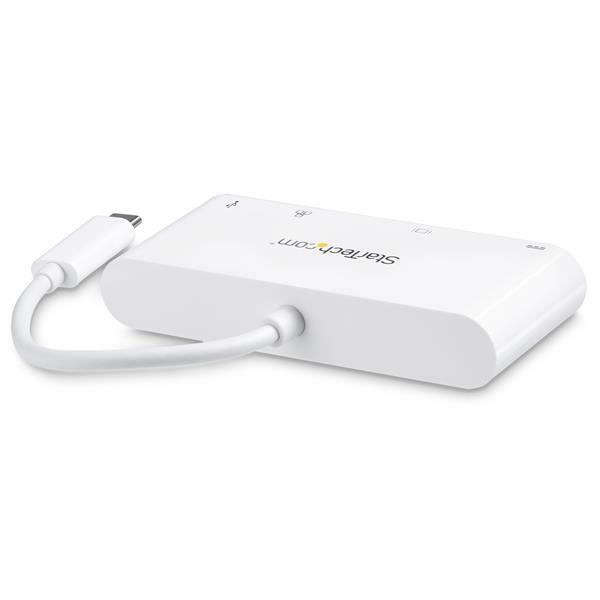 Get fast, reliable network access through the Gigabit Ethernet RJ45 port and connect a USB 3.0 peripheral device, such as a mouse or USB flash drive, all with one, simple-to-use device. 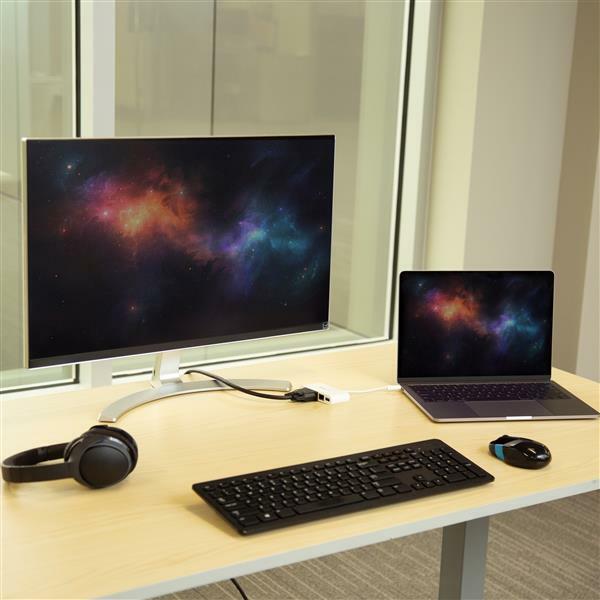 The multiport adapter’s USB-C port supports 60 W USB Power Delivery 2.0, so you can power and charge your laptop while you work. 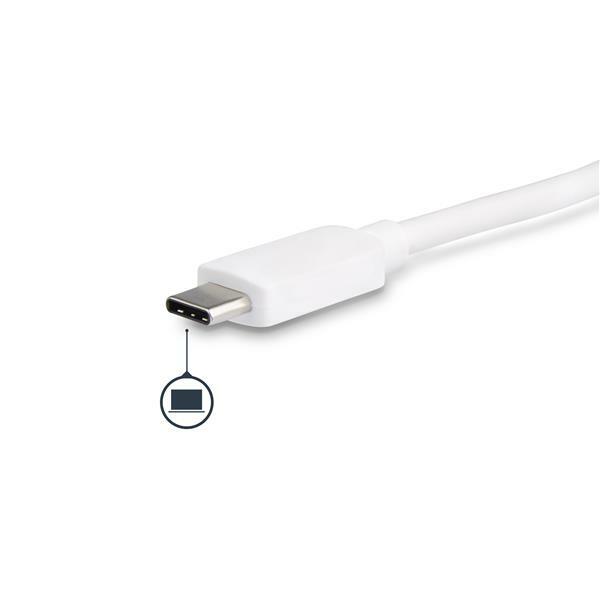 The USB Type-C multiport adapter is highly portable and features an integrated USB-C cable and USB-powered performance, so there’s no need to carry a separate power adapter with you. 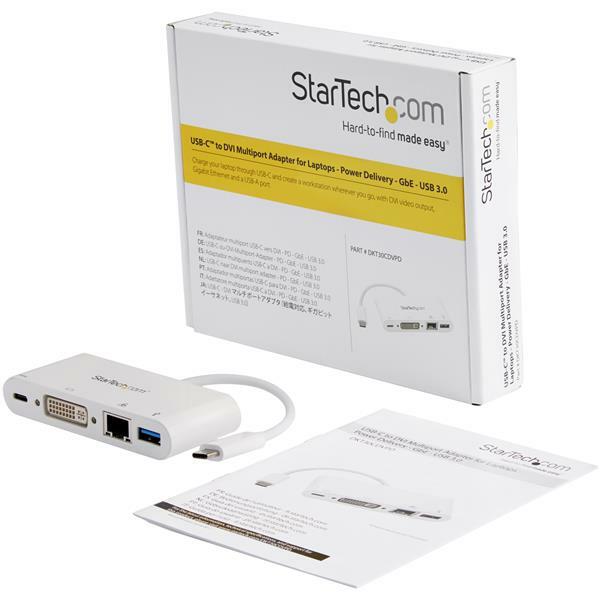 The DKT30CDVPD is backed by a StarTech.com 3-year warranty and free lifetime technical support. I received this product in exchange for an impartial review. I chose this product b/c I travel a lot and ALWAYS find myself running short on USB ports. Unless I have a long time to pack I invariably leave something and it's a headache. Hotels will try to accommodate you, but their built in peripherals are very inflexible. Bringing a docking station with you has many problems. They are big, the better ones , particularly laptop specific ones, are really big, somewhat heavy and expensive. Anything that expensive makes for a really bad travel product b/c things get left at hotels, take a beating and move around a lot. With all that wear anything delicate will get damaged and break. This on the other hand is very light. It's light and strong. Size wise, the box is no bigger than a small graphics card or wifi card. The Hub itself isn't much bigger than a cell phone. The fact it's light is very helpful b/c you can travel with it, without it adding weight or bulk. It's strong enough that it can easily withstand a drop or 5 and its small enough you can pack it anywhere. One of my biggest issues with any hub is how well things fit into it. Too tight and you have to force things (which is a recipe for disaster) too lose and things well move around and either break or break parts inside the hub. StarTech's product line always delivers in terms of craftsmanship and build and this hub exemplifies it. All in all this is a docking station that masquerades as a hub. Its a great product, a great value and honestly, I don't think I could name anything it could do better let alone find something to criticize. (5 stars) Great to use while on the road! I chose this product because when I need to travel, there is no way I want to carry around my normal docking station which weighs a lot. 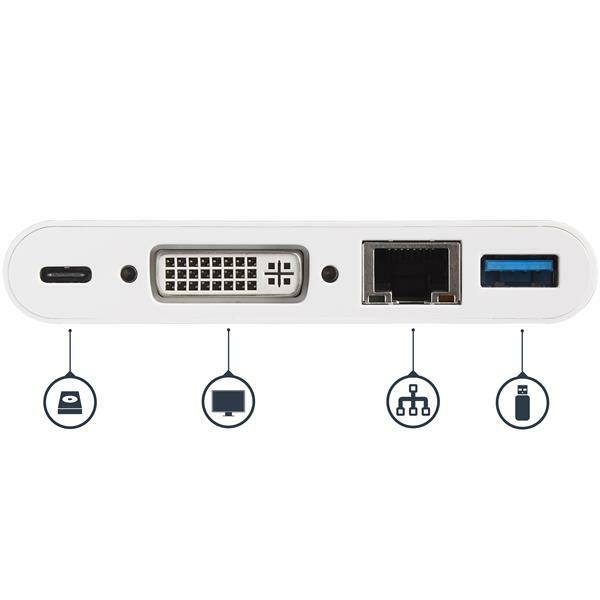 Since many smaller laptops these days only come with a handful of ports or just USB-C ports, this product comes in handy to give you back the most important and most used ports. It also allows me to hook up to a board room projector with the DVI port where I can't otherwise. It worked plug-and-play and I didn't have to install any drivers. I received this product in exchange for an unbiased review.